Insecure Wednesday | Stay and sit a spell. There are stories here. I love Wednesday! Wednesday has, for quite a while, been my “writing day.” The day where my husband is home with our four kids and I get the wonderful luxury of a day to myself. Just me and my novel! Lately, I’ve started teaching writing at Elevate Life and Art, a home school enrichment program. Could this day get any better? Wait, yes, it can and it did. 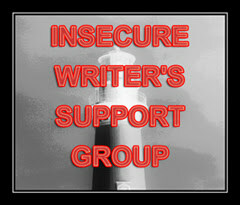 I recently joined the Insecure Writers Support Group which is a treasure chest, a font, an overflowing fountain (insert your cliche of choice) of support and information for writers like me and what’s their day….Wednesday! But this thing is no joke, this group of writers supporting each other on this long haul of a crazy endeavor we call writing. I admit, my friend and cohort, Samantha Redstreake Geary has spoken of this amazing group before, but it is only recently that I got off my keister–or rather got on it–and joined up with this group of folks, this tribe as is the current phrase and I’m so excited to see where this group is going! My people! My happy place! Thank you for welcoming me in! Welcome to the IWSG! Samantha is awesome and glad she inspired you to join. Hope this group rounds out a perfect writing Wednesday for you. Thanks! I know it will! I’m happy yo be a part of your group! Hi Amy! Welcome to the IWSG! I’ve been a member a little over a year now, and it is an awesome group! How wonderful to have the support of a husband to look after your kiddos for one day a week so you can write! I have a wonderfully supportive husband who encourages me with my writing in so many ways. I hope you had a great writing day yesterday! Happy writing this month!!! Thank you!! It’s so wonderful to have the support of your loved ones! Happy Writing to you as well! Hi! Welcome. This group is truly amazing. Alex started something special. So happy to hear that it lines up with your Wednesdays. It was meant to be. Totally! I’ve heard so many good things about this group. I can’t believe it took me so long to join! Glad to have you on board, Amy. You will find a truly wonderful group of people here in the IWSG. Hope your writing day was productive. I’m so excited to meet all you guys! This is wonderful! We’re so excited to have you here where we all learn from and support each other. Thank you, Susan. You are all so welcoming! I know I’ve joined a special group here! Welcome, Amy. I hope you find IWSG a warm and inviting place. Looking forward to hearing more about you. I’m sooooo happy that you’ve joined this wonderful and supportive group! You’ve come to the perfect place! Plus it fits in with your Wednesday programme… how cool is that? welcome to the IWSG! Writers especially need support in what they do, and this group offers to much and as helped me enormously over the years.